Disney Parks are hard at work bringing the technology from a long time ago in a land far away to life for the opening of Star Wars Land parks in Anaheim and Orlando in 2019. Much of the environment, characters, and peripherals can be recreated through construction, costumes, and other creative means, but there are some things that don't fully exist. However, might augmented and mixed reality play a role? Through various reports, along with some searching of feelings (or, inference and speculation), here's what I think we can expect to see at Star Wars Land. Last year, Disney's Lucasfilm and its ILMxLAB research and development unit announced a partnership with secretive augmented reality startup Magic Leap. Test footage, shot directly through Magic Leap technology, shows holographs of C3PO and R2D2, the former of which delivers exposition, while the latter beams a hologram of his own showing military surveillance. This would be the likeliest method by which Disney will deliver the sci-fi tech we see in the movies. The park could provide guests with headsets for specific attractions. Perhaps a partnership with Purell is also in order? Disney CEO Bob Iger, according to a report from the Los Angeles Times, puts on a headset participates in weekly lightsaber sparring sessions with a Stormtrooper. Given the previously-reported partnership, there is a high likelihood that the lightsaber is rendered through Magic Leap's headset. However, Disney World already offers lightsaber duels by way of toy stand-ins as part of its Tomorrowland attraction, so there is a possibility the AR version is meant for other entertainment purposes. If lightsaber duels are in play, then perhaps blaster pistols and cannons are as well? Imagine a shootout amongst a labyrinth of otherworldly structures, dodging lasers that spark upon impact. That sounds like a job for a mixed reality headset. While there is no evidence on this one, it seems to be a likely "leap," from lightsabers duels to blaster tag. 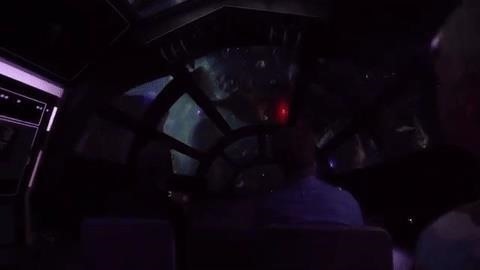 "Guests will be able to step aboard The Millennium Falcon and actually pilot the fastest ship in the galaxy, steering the vessel through space, firing the laser cannons, in complete control of the experience." Also, Disney Parks have already stated that "visitors will find themselves in the middle of a tense battle between stormtroopers and Resistance fighters," so it might not be too big of a stretch to have visitors taking part in the action. Disney Parks have also mentioned that the Millennium Falcon will be a featured ride at the park. Though such rides are typically delivered via a virtual reality experience, Iger's preference for augmented reality over virtual reality is well-documented. The Huffington Post has reported that Star Wars Land will be a truly immersive experience, with visitor's actions at the park triggering consequences that may align them with the Resistance or the First Order, or pit them against smugglers and bounty hunters. Disney parks already deploy RFID-equipped wristbands that feed information about visitors to characters, which could facilitate this "choose your own adventure" experience. However, mixed reality could interact with these devices to delivery variable content to visitors. 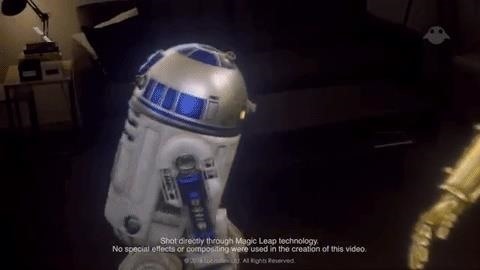 As demonstrated by the Magic Leap test footage, we know that the technology can deliver holographic content reminiscent of communications in the Star Wars films. It would make sense to leverage this experience at the parks to deliver different messages based on visitors' actions. Could holograms also be used to communicate with friends and family at the park? As reported by Network World, mixed reality platform Vuforia recently introduced Smart Terrain, a feature that "enables content to interact with objects as well as the surrounding environment," and its integration with the depth-sensing cameras on Tango-based devices. These advances open up the possibility to bring dejarik, the holochess game played by numerous Star Wars characters aboard the Millennium Falcon, or perhaps an establishment like...a cantina? The Mos Eisley Cantina scene in the original Star Wars movie stands as one of the most recognizable and referenced moments in the entire saga. While Star Wars Land will be based on a locale not featured in the films, the park will feature a cantina. Could we expect games of chance and other AR entertainment similar to those featured in The Force Awakens? With the opening of Star Wars Land and the arrival of Episode IX of the famed space opera, 2019 will be an exciting year for fans of the franchise. What other AR attractions do you believe Disney Parks will bring to life at Star Wars Land? Speculate with us in the comments below.